Natural cleansing can bring numerous benefits that help you reach your health and fitness goals easier. Just take a look over the below list. Far too much we hear about the benefits of fad diets that can help you shed 60 pounds in 6 days and detoxes that help restore your body’s natural pH balance or whatever. Most of the time, these are ineffective and sometimes even harmful for your body. However, one of the healthiest trends that are on the rise is natural cleanses. Unlike most other fad diets, natural cleanses allow your body to rid itself of wastes and toxins in a healthy fashion, all while supporting your body nutritionally. In this article, we’ll be discussing the benefits your body gets from natural cleansing. Ditching junk foods is the first step in natural cleansing. If you’re not familiar with what a natural cleansing entails, then feel free to read more about it. This guide will teach you all you need to know about natural cleanses and the size of the task ahead. What a lot of people may not know is that diets that involve starving your body of food do not work and are actually incredibly harmful to your body. The good thing about natural cleansing is that they do not rely on you starve your body of some nutrients, and rather provides it with proper nutrition, allowing it to rebalance itself and function properly. That being said, natural cleansing usually involves periods of intermittent fasting as well as some form of calorie restriction. These have proven to be very effective for weight loss, and provide sustainable results, unlike those of fad diets and detoxes. Your body releases a hormone called cortisol when you feel stressed. One of the effects of cortisol is reduced liver function. Refined sugar, processed foods, alcohol, caffeine – all of these stimulate your adrenal glands, which can make you feel fatigued and overwhelmed at times. In a natural cleanse, you eliminate these artificial stimulants from your diet and instead replace them with healthier, more natural options. The result is that your adrenal glands have an opportunity to rest, heal and reboot. This helps you deal with the everyday stresses of life without becoming overwhelmed, and allows you to stay focused and energized. A lot of the foods we eat can negatively affect the way your skin looks, especially if consumed too much. By replacing much of the artificial food you consume with more natural counterparts, you help your skin regain its natural glow. It is a good idea to couple a natural cleanse with regular exfoliation and drinking filtered water. This will ensure that your pores remain clear and can get rid of toxins without getting clogged up. As you might know, your liver is primarily responsible for breaking down toxins in your body and flushing them out. If your liver is overworked and is faced with too many toxins to break down, you’ll find your energy levels dropping and you’ll feel sluggish and fatigued. Removing these artificial substances from your body will free up some of your body’s energy and leave you feeling more energized. In turn, this can also improve your mood and your concentration levels. A natural cleansing can lead to a stronger, more resilient immune system. How so? Some of the foods we consume, especially those loaded with processed and unnatural substances can be very harmful to your body, and act as toxins. If you’re getting sick frequently (colds, rashes, stuff like that), that might be a symptom that you need to start a natural cleansing. After a cleanse, your blood is not cluttered with harmful toxins, and so your white blood cells are allowed to move better and are allowed to do their job of destroying harmful bacteria more effectively. Who here hasn’t had a craving for a nice, juicy burger at 2 in the morning, or an insatiable desire for a nice cheesy pizza in the middle of the day? While indulging your cravings every once in a while isn’t too bad, too many cravings can signify a hormonal imbalance. During a cleanse, you are usually taking plenty of fluids and fibrous fruits and vegetables. These fluids, fruits, and vegetables can fill you up and break any cravings you might be having for snacks or unhealthy food. Over time, your body will completely stop craving junk food and will yearn for healthier options instead. Highly refined foods with plenty of carbohydrates and sugars have been linked with increased joint and cartilage inflammation. Minimally processed foods, on the other hand, have been proven to have anti-inflammatory properties, especially whole-grain bread and produce. This may seem a bit bizarre, but it’s quite real. As your body begins to cleanse toxins, it also begins to work layers of deep-rooted emotion. These deep-rooted emotions may have manifested themselves within your body, as physical aches and pains, alongside possible reduced organ functionality. Deep natural diet cleanses actually help one’s emotional well-being and help work on severe emotional trauma, which is one added bonus that not many people may be familiar with. Reading this, you may be quite intimidating to begin a natural cleanse, as it spells quite a change from your regular day-to-day diet. That’s not necessarily true. Although many natural cleansing diets may suggest limiting your food intake to fruits, vegetables, green smoothies, and filtered water, the truth is that’s not a sustainable diet for an adult human being. 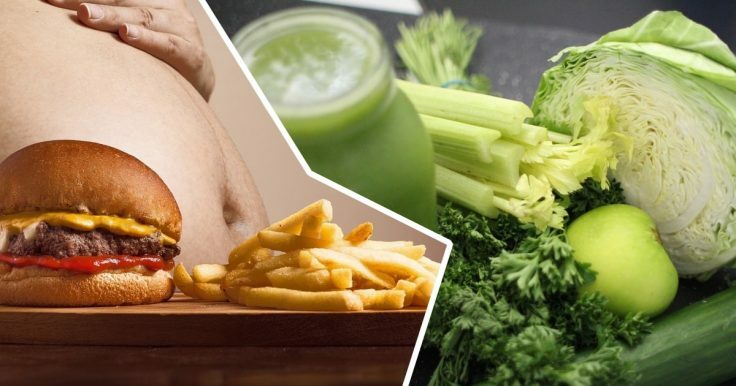 And while you might be reluctant to give up the wonders of burgers, fries, pizzas, and other delicious junk food, you don’t necessarily have to. It will suffice if you limit your intake of these types of foods and not have them make up the entirety of your diet. Regardless, it is a big step to take, but the benefits of undergoing a natural cleanse far outrank the negatives. And you will thank yourself for it down the line. At the end of the day, you want a healthy body that you can be proud of.